I was honored to be contacted by Brides Magazine NY to be featured in two segments in their Fall/Winter '07 issue of Brides Houston Magazine. I called my client Tina & John and said "Hey can I feature your wedding in a magazine and they were like YEAH!" 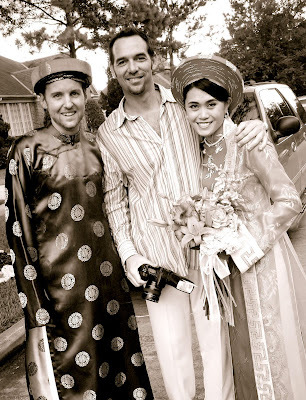 Here I am with John & Tina...It was a long fun day with both American & Vietnamese cultural traditions being celebrated...these two are both full-time international aid workers living in Bangkok, Thailand.